It’s time to share some recipes that are good to serve on St. Patrick’s Day. I have some fun recipes up my sleeve and I will start with Beer Batter Onion Rings. 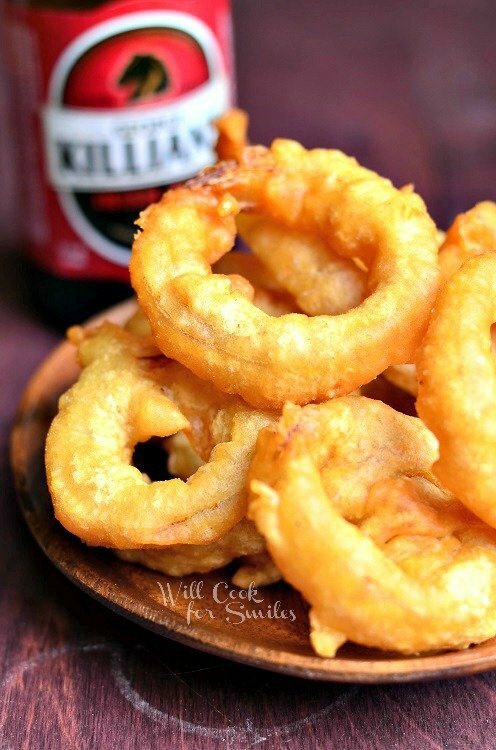 Delicious fried Onion Rings made with Killian’s Red Ale beer batter. Like I said above, I have a few beer recipes for you in the upcoming week that I hope you will love. I have these Beer Battered Onion Rings, I have Guinness Glaze and Chocolate Stout bread coming your way. There are also so many wonderful St. Patrick’s Day ideas floating around from my fellow bloggers. Many green recipes, corned beef recipes, Bailey’s Irish cream and beer recipes. I can’t wait to see them at our weekly party and I hope that you will come back to check them out on Saturdays. If you don’t feel like making the cheese dip, try these onion rings with ranch, honey mustard, BBQ sauce, whiskey sauce or plain and simple. There is enough wonderful flavor in them to not need anything at all. I have some fun recipes up my sleeve and I will start with Beer Batter Onion Rings. 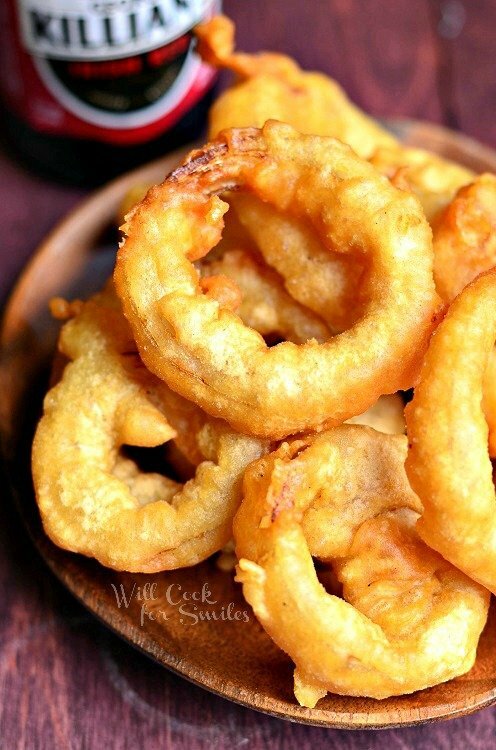 Delicious fried Onion Rings made with Killian's Red Ale beer batter. 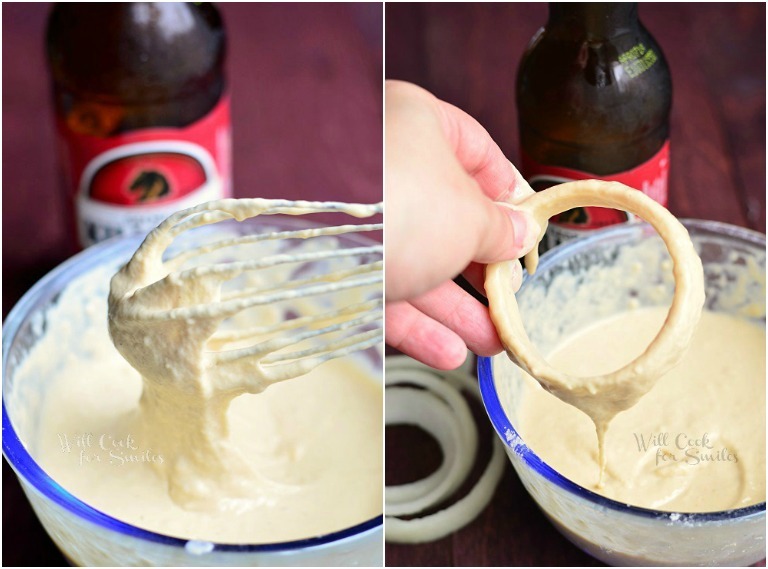 In a medium mixing bowl, whisk flour and beer together until smooth. Whisk in Worcestershire sauce, salt and pepper. Taste the batter to make sure you have enough salt. Cover and set aside for about 30 minutes (if you have the patience). Slice the onions into thick rings. Pat them dry from the onion juice. Dip the onion rings into the batter and slowly add them to the hot oil. Fry until they are golden brown. 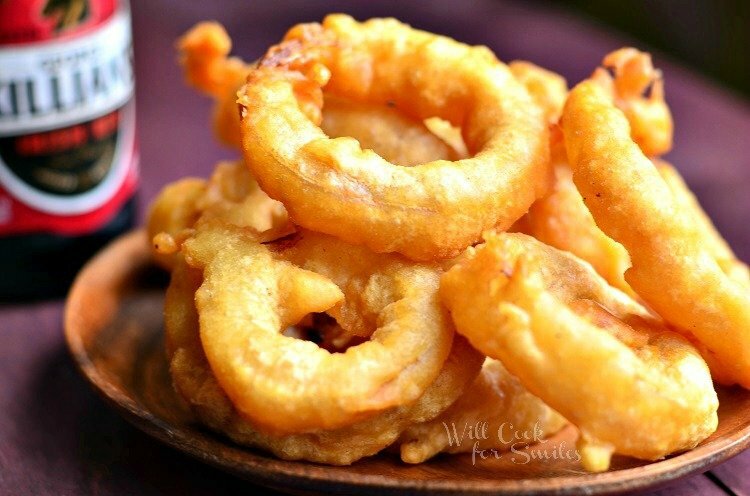 Lay the cooked onion rings onto a paper towel to soak up excess oil. Check out my Cheddar Ale Dip, it would go perfectly with these onion rings. Lyuba, loving how you incorporated this beer in with this beautiful batter. They look absolutely amazing! I just found your blog for the first time from a link party at Rattlebridge Farm… these onion rings look amazing! I’ll definitely be making them and sharing with my own friends — i’m a sucker for deep fried apps. 😉 Come visit my new blog if you have a chance — I could use some new blogging friends! Welcome, Tracy! Thank you for your sweet comment! We aren’t alcohol drinkers. What would you recommend as a substitute? Oh, Katie, you can use non-alcoholic beer, like O’Douls! Seriously!!!! I opened this in my inbox with the hubs standing behind me. He had a few choice words when he saw the pic- because……..now we HAVE TO make them!!! 🙂 YUUUUUMMMM!!!!!!!!!! You found my weakness – fried food. Oh my!! Awww, that is so nice 🙂 Thank you, Gina! I hope you love it! Lyuba, these onion rings look amazing! I am definitely going to try these – thank you so much for sharing at Best of the Weekend! Pinning! Have a happy Sunday and a fabulous week! Wow, Lyuba, these are so mouth watering and your photography is stunning! 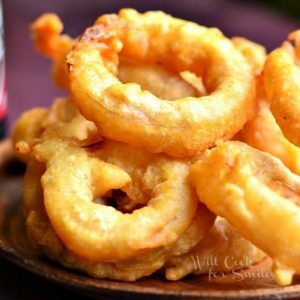 Onion rings are a favourite of mine and this recipe is definitely be saved. Thanks so much! These look PERFECT! 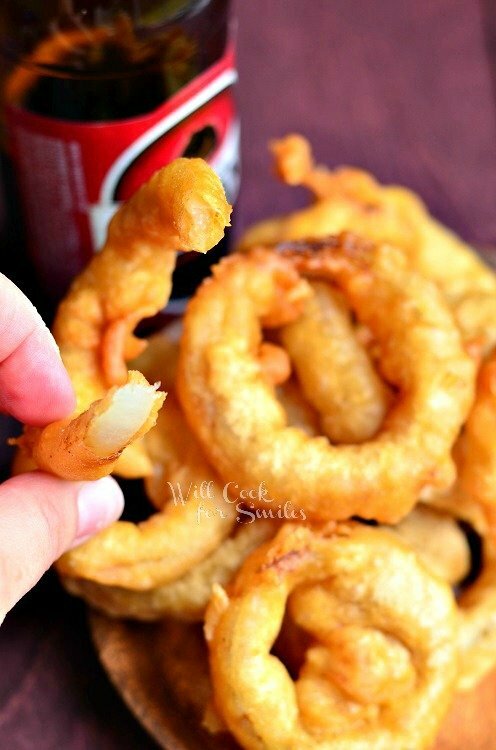 I love onion rings but have only made them once at home….can’t WAIT to try these! I do love onion rings but have never made them at home! Yours look perfect! So you used millions for the beer then? Any other suggestions? I use Killians, yeap. You can use another Ale. I would suggest something dark, like ale or lager, with a lot of flavor. You don’t want to use anything like a Bud, not much beer flavor from those. Christmas Dinner: Fried a turkey for dinner this year. After the bird was done, while I had the oil hot, went ahead and did this onion ring recipe. The rings turned out amazing. Everybody ate the rings and then didn’t want dinner.